In 2006, Ecobank Transnational Incorporated launched a simultaneous public offering operation on three African stock markets. €is exceptional listing gave the group greater financial flexibility, a diversified, popular and truly pan-African shareholding and enhanced its reputation and financial rigor. Moreover, such operations promote regional integration and improve the depth and liquidity of markets which also benefits shareholders. In 1985, under a private sector initiative spearheaded by the Federation of West African Chambers of Commerce and Industry (FEWACCI) with the support of the Economic Community of West African States (ECOWAS), EcobankTransnational Incorporated (ETI) was established in Togo as a bank holding company with a dual mandate: firstly, to build a world class African bank; and secondly, to contribute to the economic integration and development of Africa. Today, the Ecobank group has operations in 29 countries with 800 branches and offices and a staff complement of more than 11 000 professionals. It generates more than USD 1 billion in gross revenues and has a balance sheet of approximately USD 9 billion. Ecobank’s performance to date, along with that of other banks in Africa, confirms that Africa is a good investment destination despite perceived risks. ETI was incorporated as a public limited liability company with an authorised capital of USD 100 million. ETI’s initial paid-up capital of USD 32 million was raised from more than 1 500 individuals and institutions from West African countries. The largest shareholder was the ECOWAS Fund, the development finance arm of the ECOWAS. In 2006, for strategic reasons, the Ecobank Group undertook the first and only simultaneous multiple listing of its shares on all three stock exchanges in West Africa: the Ghana Stock Exchange (GSE), the Nigerian Stock Exchange (NSE) and the BRVM, the regional stock exchange for Francophone West Africa. The multiple listing provided financial flexibility for the group’s future capital needs and it was paramount for Ecobank, as a truly Pan-African Bank, to have access to available and suitable capital markets in West Africa. This was exemplified by the raising of more than USD 550 million on the three exchanges in the middle of the financial crisis in 2008. ETI share capital has thus remained very diverse. Institutions, individuals and the group’s staff constitute the shareholding base. There is no majority shareholder. Today, ETI’s paid-up capital amounts to USD 775 million owned by about 175 000 shareholders, most of whom are African, and of which more than 170 000 are individuals. Geographically, the shareholding base spreads across Africa and Europe. Moreover, since its listing, ETI’s share price has performed reasonably well in spite of the downturn in the capital markets, mainly thanks to the solid financial performance of the group (Figures 1 and 2). Raising the standard of transparency about the group’s operations has also been a motivating factor for listing. Along with the fact that the group reports according to IFRS1, providing information on the group’s operations and financial results to meet the requirements of the different stock markets ensures that the group maintains a high level of financial discipline and rigor. Ecobank brand awareness is strong across Africa and this, as a tool for business development, is obviously an advantage that the group has derived from the ETI multiple listing. 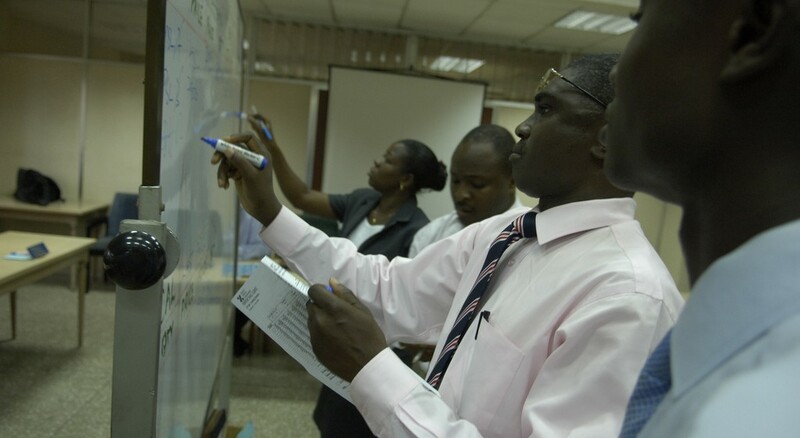 2006 and 2008 Initial Public Offerings (IPO) campaigns have proven to be efficient vehicles to raise and to strengthen awareness of the Ecobank brand. In Ghana for instance, Ecobank is fast mobilizing deposits as investors prefer to use the bank given its listing and membership of a pan-African banking group. This improving awareness of the brand has also made it easier for the group to expand its footprint through acquisitions of other structures. Indeed, the requisite level of transparency and financial discipline associated with its listings means that it is easier to convince central banks to consider acquisition proposals. Enhancing the liquidity of ETI shares was also one of the objectives of the multiple listing. Stock markets in West Africa have limited depth and liquidity and listing Ecobank on any one of these markets alone would have limited the liquidity of the shares. The triple listing provided convenience to shareholders in terms of the ability to easily trade the shares. Multiple listings also expose the bank to a wider investor base, especially retail investors, as it helps to improve investors’ choices relating to preferred sale points. The different markets have actually provided convenience for shareholders of the various regions to sell in their respective markets. For example, it would have been difficult for retail shareholders in Nigeria to sell their shares if ETI shares were listed only in Ghana or vice versa. As a consequence, ETI is now one of the most actively traded stocks on the BRVM and the Ghana Stock Exchange, which has in turn helped to improve the liquidity of these exchanges (Table 1). There was also an important developmental objective in deepening and integrating the economies and capital markets of the countries in which the group operates. This motivation is grounded in Ecobank’s belief that the financial sector is central to meaningful economic development, especially in the current globalised world. A strong financial sector can provide the capital needed for other sectors of Africa’s economy. An exciting benefit is the platform the group has offered participants in different markets to use alternate neighbouring markets. The stocks were listed at the same price but with time there were arbitrage opportunities because of market imperfections. Arbitrage opportunities have thus been possible, for the sole benefit of investors. Investors can actually monitor price movement on the various markets and use the information on where to buy or sell to their advantage. This helps to identify the bottlenecks in executing cross border transactions and as such, resolution of trading inefficiencies has been greatly enhanced. This will aid in the regional integration efforts of the three markets. Ultimately, as information feeds through the various exchanges, the market imperfections will get corrected and the simultaneous listing will enable regional markets to become more efficient. Multiple listing does have its drawbacks. Audit and compliance costs are higher compared to single listing because of the different requirements of each stock market. Administrative issues including accounting disclosures, prospectus disclosures, financial formats, and governance requirements are all subject to multiple securities laws. Moreover, transaction costs, such as brokerage, listing and other costs are higher. Finally, market imperfection and arbitrage opportunities also have to be dealt with. and that early positioning and involvement in the capital markets of Africa will enhance the group’s chances of tapping into the development of these countries in the future. As an illustration, ETI managed to raise more than USD 550 million through a retailled public share offer in 2008, despite the global financial crisis when the offer was launched. The challenges and drawbacks of multiple listing may deter many companies from cross border listing. Thus, measures should be implemented to reduce such costs, by harmonizing procedures to get listed on the different African stock exchanges.